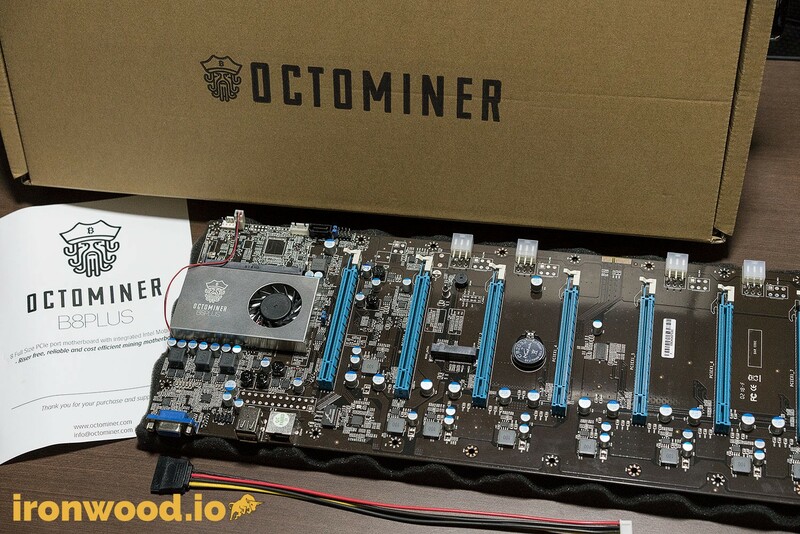 Octominer B8PLUS is a specialized motherboard designed for GPU mining. If you had been spoiled by the various included accessories bundled in a gaming motherboard, you will be sorely disappointed. 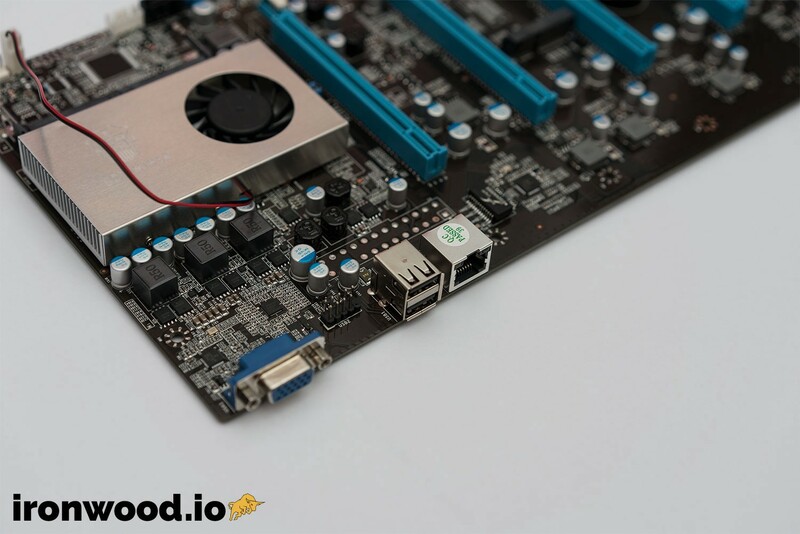 The only accessory included is a custom cable that allows you to tap on the motherboard’s 5v for your SATA SSD, if you are not planning to use the mSATA slot. 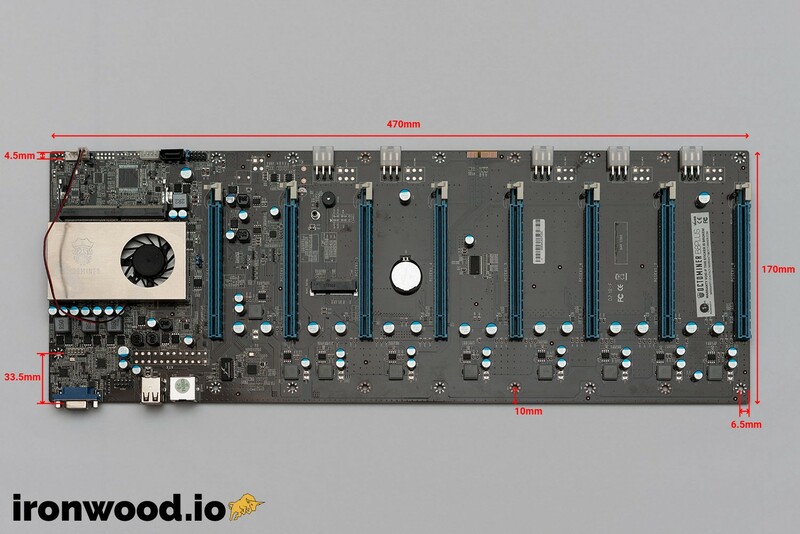 As this board is not an ATX form factor, it does not include an ATX rear plate. There is also no instruction manual. The quick start sheet is supposed to be sufficient for you to get it up and running. The B8Plus comes with an integrated processor and a low profile cooler, with all eight slots being x16 form factor. These two features already help on reducing your initial expense. The issue is, as of today, DDR4s are still very expensive, and you probably do not have any SO-DIMMs lying around. I don’t fault using SO-DIMMs, as if you look at the board itself, it would be hard to design it with a full-size DIMM slot while retaining the current profile. It is interesting that they decided to implement the older mSATA instead of the NGFF M.2 slot; however, you should be able to buy an mSATA to 42mm M.2 adapter from eBay that would fit. This is not the only odd choice, considering they had a VGA port instead of HDMI, but having a VGA port will save you some on a HDMI dummy plug (which is required on most motherboards to trick remote sessions to utilize your integrated GPU), plus you can repurpose an older VGA monitor and KVM switch. 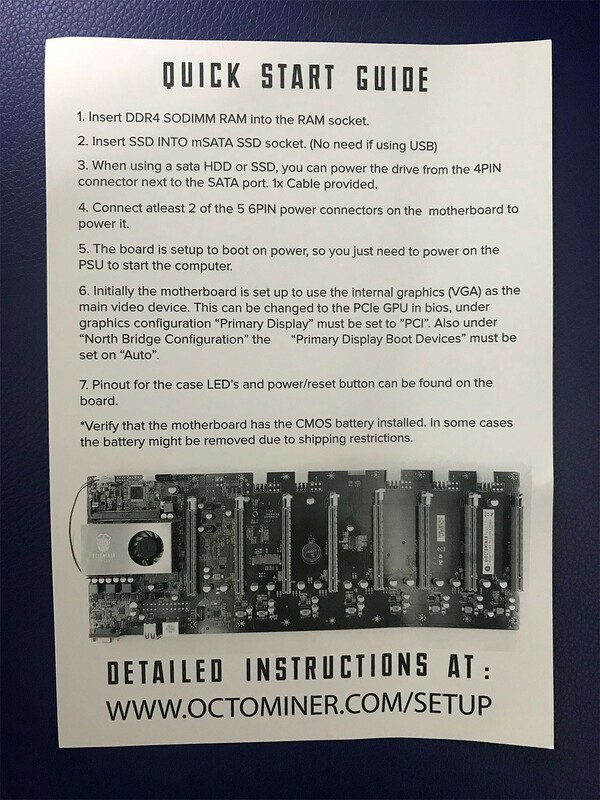 However, if you already had an existing investment on HDMI/USB KVM for your existing rigs, adding this board would require you to invest in a separate VGA/USB KVM. The board itself has no ATX connectors; the headers pads are there but filled. The only reason I could think of is that they want you to use a server PSU instead. If you are wondering how you would power the board, it is powered by the first 2x 12v 6-pin connectors. The board has a total of x5 6-pin connectors. There is also another 5x 6-pin connector pad that was filled. If you do the math, you could be dividing up to 600W(8x 75 Watt) over 5x 6-pin (commonly rated at 75 Watt) connector. This configuration is typically fine as long as you use decent cabling and have a strong power supply. If you are running 8x high-powered cards. like the 1080ti, please remember to monitor your 6-pin cabling for heat buildup and swap them with higher quality cable if they get hot. Based on my testing, all the 6-pins seem to be connected to a single rail. 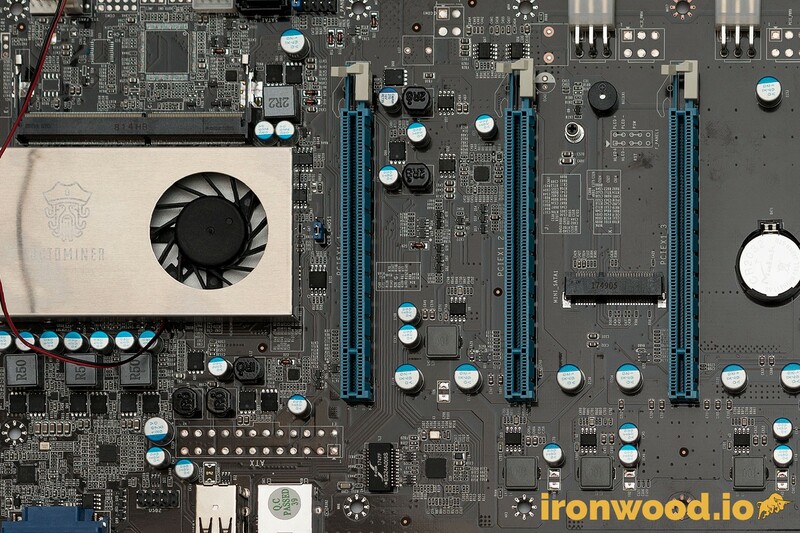 The motherboard itself can even be powered by just a single 6-pin. With my multimeter probing, the ATX pads seem to be a functioning. This entire integrated solution is extremely power efficient. 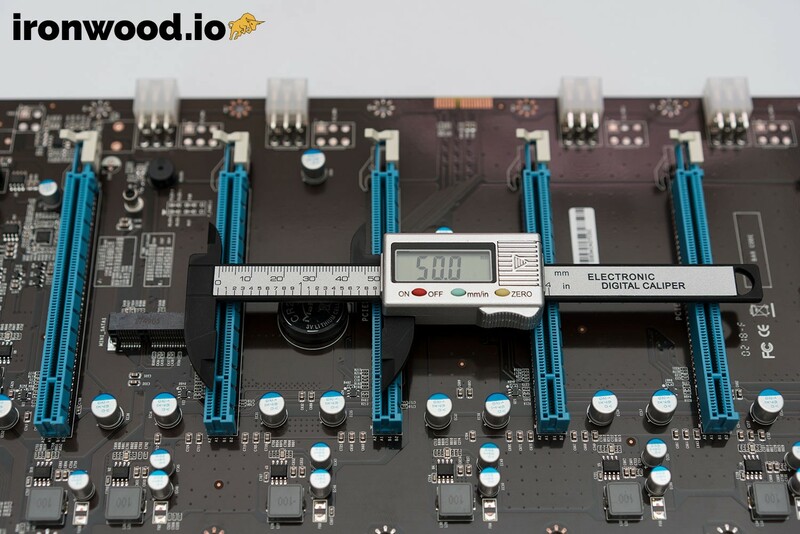 The PCIE to PCIE slot distance is 50mm, meaning you will not be able to install an 8x 2.5 slots card. I am only able to fit up to 4x Aorus 1080tis. The Aorus card even manages to block the neighboring PCIE, so even using risers for the other 4 slots is out of the question. The official stance for high-powered card is that they support up to 4.5cm thick cards, but 4cm and below is recommended. Using a high CFM fan is also necessary. 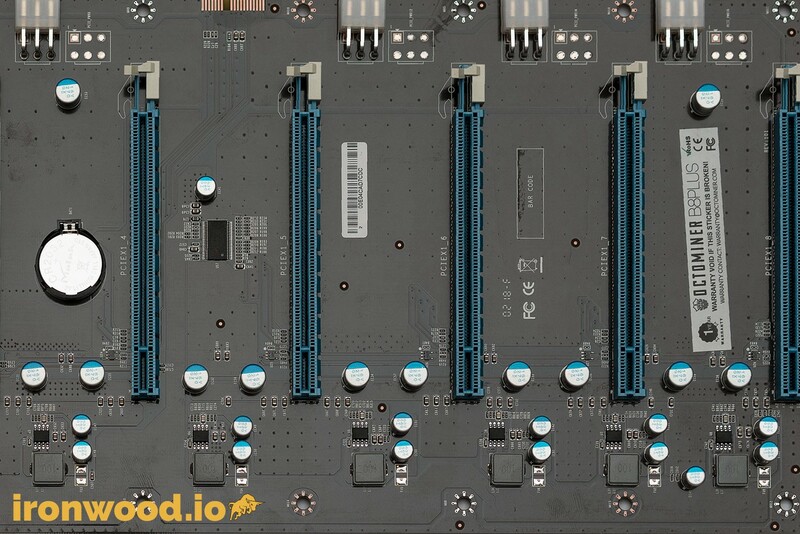 A First Time Miner:If you are only planning to buy one, coupled with the official chassis and power supply, you would end up with one of the most space efficient off-the-shelf solutions. The chassis pricing might not be as attractive if space isn’t an issue to you. Large Scale Deployments:Definitely, yes. Having an integrated CPU and removing the need for risers reduces the expense. However, you would need to look at a custom racking solution from your local vendor. The cost of the official chassis is not as attractive if you only buy a few (due to shipping), but for massive scale deployments, please contact Octominer directly to discuss a better pricing and delivery option. Having a custom board with integrated features and being riserless helps to reduce the complexity involved, which translates to faster deployment times and cheaper operations and management — and all of these will scale exponentially depending on the deployment size. Off the shelf high density solution. 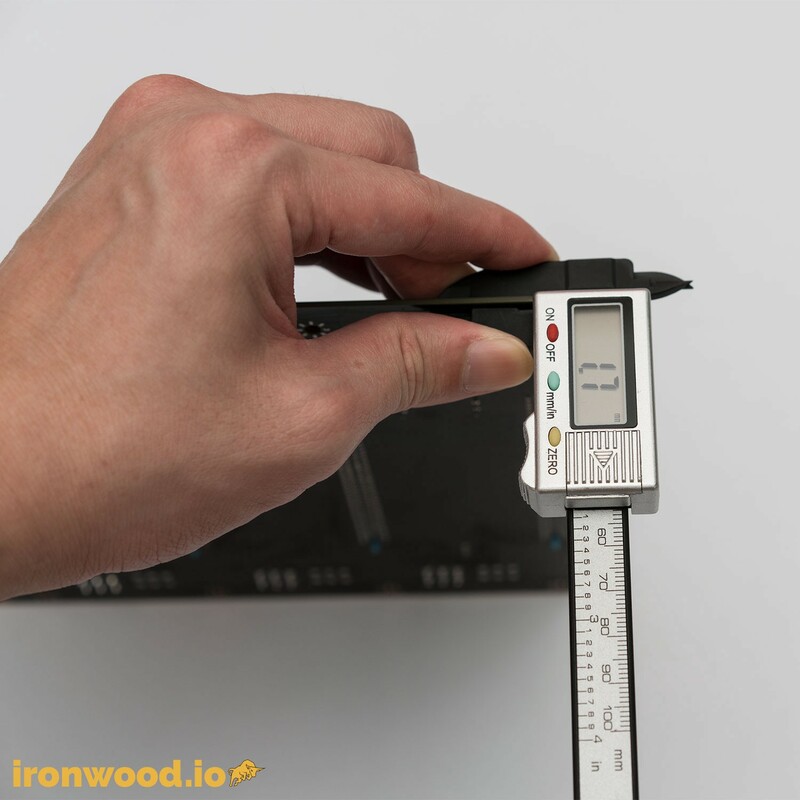 Less complexity without the need of risers. Attractive pricing for the motherboard. No ATX connector — pads are there but mysteriously filled. No official diagram and physical measurements provided.